La chouette et l'escargot (Dupin 388). 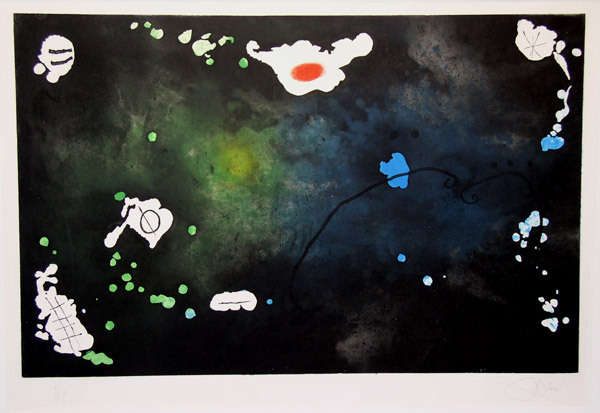 Original etching and aquatint, 1964. 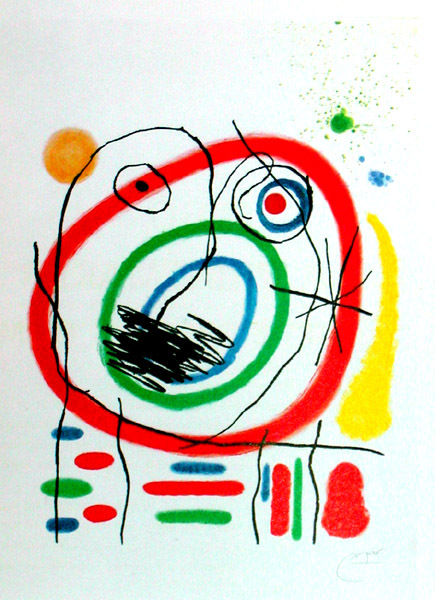 This work was used by Aimé Maeght, Miro's dealer, as his New Year's card in 1964. Edition unknown but presumed small. (Etching is too fragile for large editions.) Another impression of this work is in the permanent collection of the Metropolitan Museum of Art, a gift, according to the Met's collection card, of former Met and MoMA curator William S. Lieberman. A beautiful, early, color etching. Since originally the only way to get one of these etcings was to receive it as a gift from Galerie Maeght, Paris, they are very difficult to come by. Image size: 172x114mm. Price: $3500. Archipel Sauvage I / Savage Island I (Dupin 337). Original color etching and aquatint, 1963. 35 signed & numbered impressions on Arches with a Maeght watermark; ours is one of several HC impressions. 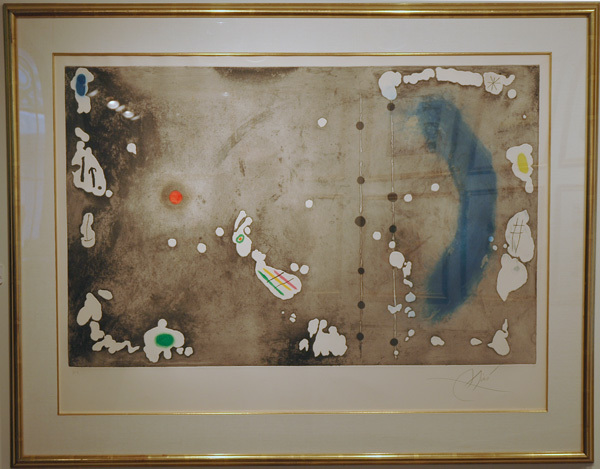 This was photographed on the wall and the Miró lithographs across the hall are reflecting in this piece, particularly on the right side. In fact, the work does not include any other reflected images. Image size: 585x917mm. Price: $33,500. Archipel Sauvage IV / Savage Island IV (Dupin 340). Original color etching and aquatint, 1963. 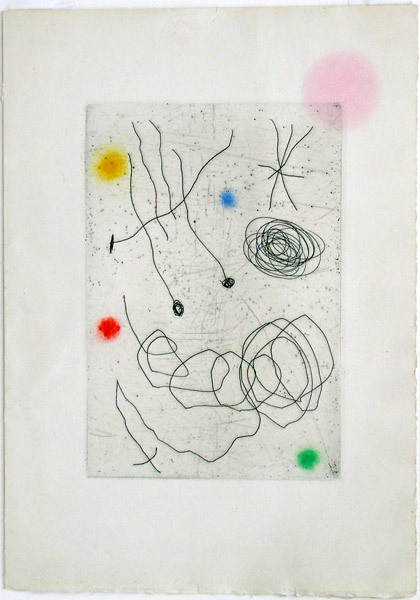 35 signed & numbered impressions on Arches with a Maeght watermark, of which this is n. 31/35. Individual impressions are hand-wiped and show much variation. Image size: 585x908mm. Price: $33,500. Archipel Sauvage IV / Savage Island IV (Dupin 340). Original color etching and aquatint, 1963. 35 signed & numbered impressions on Arches with a Maeght watermark; this is one of the HC impressions. Individual impressions are hand-wiped and show much variation. Image size: 585x908mm. Price: $33,500. Je travaille comme un jardinier / I work like a gardener (M. 416). Original color lithograph, 1964. 30 signed & numbered impressions (plus XV impression). Published by XXe Siecle for the portfolio of the same name. This is one of four color variants of this image. Image size: 222x222mm. Price: $6000. Porteur d'eau V / Water carrier 5 (D. 341) Original drypoint and aquatint, 1964. 30 signed & numbered impressions on B. F. K. Rives published by Maeght Editeur in Paris. 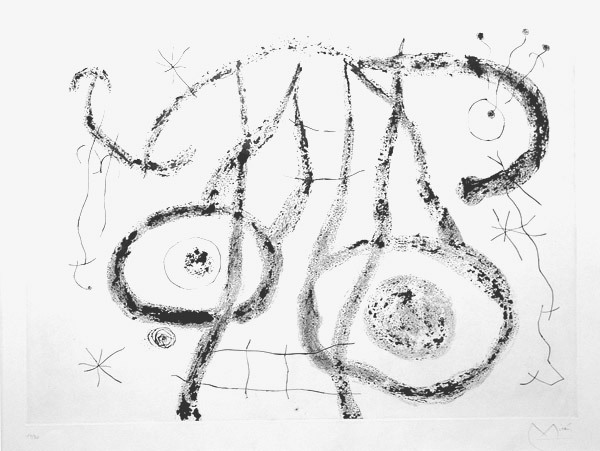 One of Miro's first masterpieces using large scale and carborundum to achieve an almost painterly richness of texture. Image size: 570x795mm. Price: $15,000. Diana the Huntress (Maeght 458). 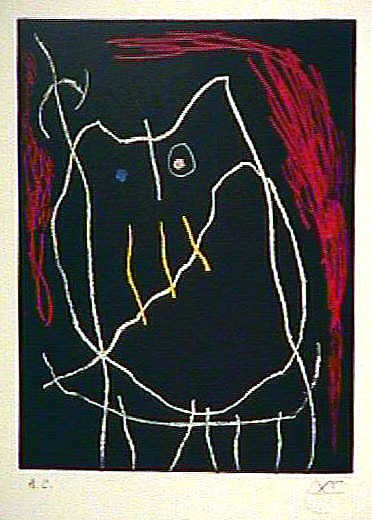 Original color lithograph, 1964. c. 1500 unsigned impressions as published in the deluxe art review, Derriere le Miroir. This is a color variant of M457, published in an edition of 75 signed and numbered impressions. In classical myth, Diana is the goddess of the hunt, a chaser who is herself chaste, and the goddess of the moon, Image size: 380x280mm. Price: $1250. Grand Duc II (Dupin 395). Original color etching and carborundum, 1965. 75 signed and numbered impressions. 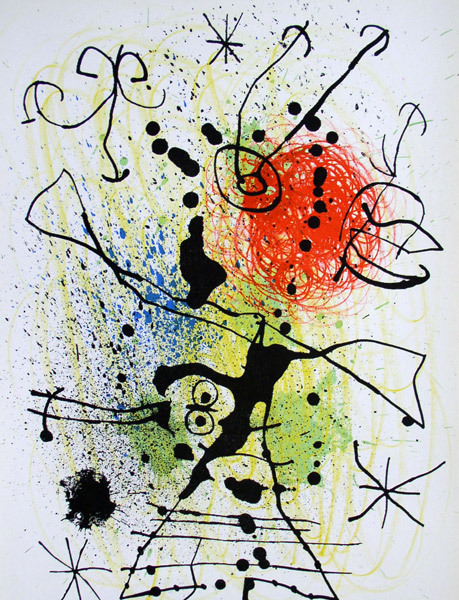 One of Miró's most amusing portraits, the Grand Duke, monocle and all, has been included in Miró retrospectives at the Musée d'Art Moderne, Villeneuve d'Ascq Nord, Fécamp, and Tarascon. Image size: 680x530mm. Price: $32,500. La prophète encirclé (D. 396). 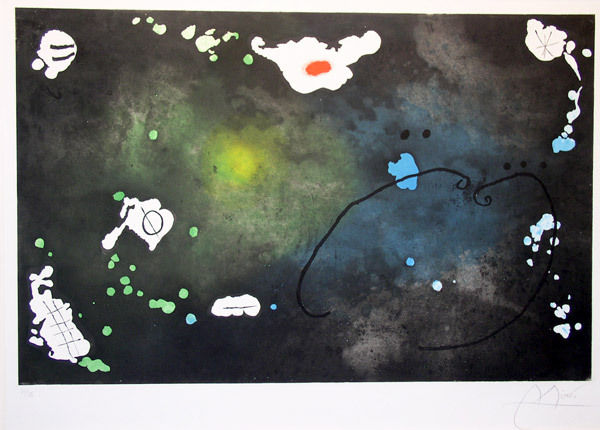 Original color etching and aquatint, 1965. 75 signed and numbered impressions, plus several artists proofs (of which ours is one) and HC impressions. Repaired tear at bottom center not affecting image. 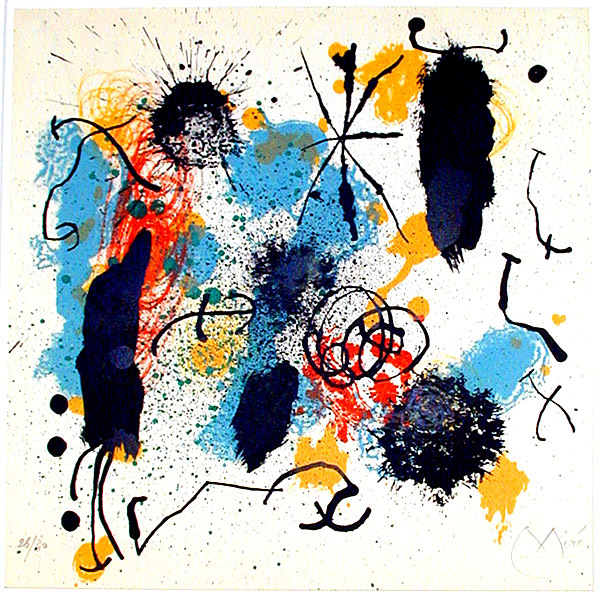 Reproduced in Indelible Miró. Image size: 900x635mm. Price: $35,000.